It has been almost nine months since my previous CEO message, which was titled “Why Uranium, Why Laramide, Why Now?” and while the macro environment has evolved much as we expected and discussed in that piece, timing of the uranium market’s rebalancing – and more critically for investors the magic “inflection point”: where people feel emboldened to jump in – remains the great unknown. In light of the fact that the bear market in uranium is now well into its seventh year, the sage words of legendary baseball manager Casey Stengel to “Never make predictions, especially about the future” would seem to be particularly appropriate advice for uranium company CEOs. While we at Laramide are mindful of this advice given the numerous false starts that have been endured on the road to price recovery for the sector, something does seem to be different this time and things may finally be falling into place at last. Possible pro industry policy action in the United States in the form of domestic quotas or targets for US based production. While every one of these developments is welcome and constructive towards the market rebalancing narrative, taken together it’s hard not to believe that something may indeed be different this time – especially since we have positive catalysts on both the supply AND demand sides of the equation. The positive long-term picture in uranium remains largely unchanged since China made the decision in the early 2000s to adopt nuclear power in a meaningful way so what caused the epic bear market we have endured for the last 7+ years and what will end it? To simplify things, we believe what has occurred is the colliding forces of a serious demand “shock” (the Fukushima event when Japan turned off all of its nuclear plants at once) combined with a simultaneous supply shock in the form of a massive (and untimely) production expansion from Kazatomprom – a nation state supplier more interested in market share gains than profit maximization. What seems to be developing now, and what creates cause for optimism, is that the market impacts of these two events have largely run their course, especially given the aggressive proactive actions taken recently on the supply side by industry leaders Cameco and Kazatomprom. The Cameco action is particularly noteworthy and will, in our opinion, be the most determinative in changing the market trend from bear to bull. On July 25, 2018 Cameco updated the status of the McArthur River Mine shutdown (originally disclosed in November, 2017) and announced a decision to suspend production indefinitely. Of almost equal importance in their announcement – at least to prospective producers like Laramide – was that Cameco said McArthur would not reopen until mine production could be restarted on the strength of new long-term contracts with utilities. Given that McArthur River accounts for 11% of global annual uranium production (supplying almost 1.5 million pounds per month) it is hard to see how this action will not accelerate the market rebalancing already underway. The other recent macro development of particular note to Laramide is the acceptance on July 18, 2018 by the US Commerce Department of a Section 232 petition under the Trade Expansion Act. 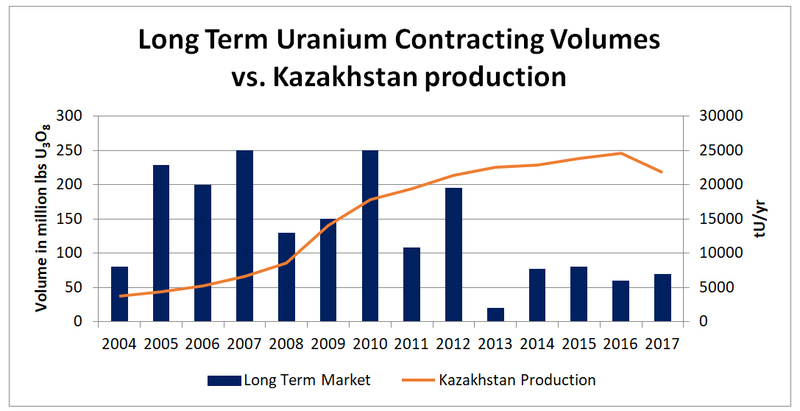 In the petition, filed by two U.S. uranium companies, quotas were sought which would require 25% of U.S. uranium requirements to be sourced domestically. While it is not possible to predict any outcomes of this trade action at present, any movement towards production support for US projects would almost certainly be a material positive for Laramide given the relative scarcity of existing US domiciled mines and late stage uranium projects. In our estimation, there are no more than 6 or 7 public companies with any potential to deliver near to medium term uranium to US utilities and none appear to be as attractively valued as Laramide today on a comparative in-ground resource valuation metric. Part of Laramide’s modest valuation relative to this US peer group may be explained by the equity overhang which was created this year when Global X – the industry’s largest ETF (symbol URA on NYSE) and previously the Company’s largest shareholder – decided to complete a widely publicized portfolio rebalancing strategy. This strategy necessitated reducing the weighting of smaller capitalization uranium equities like LAM in favor of larger capitalization global companies more tied to the nuclear business generally. This impacted the share performance of almost every peer group company but we were particularly affected since our modest capitalization made us ineligible for inclusion going forward. We elected to be proactive in assisting this rebalancing exercise and are pleased to report that, in early August, all of Global X’s shares were acquired by new holders, including new institutional owners, all of whom share our constructive view on the immediate prospects for the uranium sector. We are not alone in this positive view and it is heartening to see brokerage industry and media interest pick up, including recent coverage by the likes of Bloomberg and the Wall Street Journal. We attach a copy of that article for your reading pleasure. This message contains forward looking statements which are subject to a variety of risks and uncertainties which could cause actual events or results to differ materially from those reflected in the forward looking statements. The Company does not intend to update this information and disclaims any legal liability to the contrary.